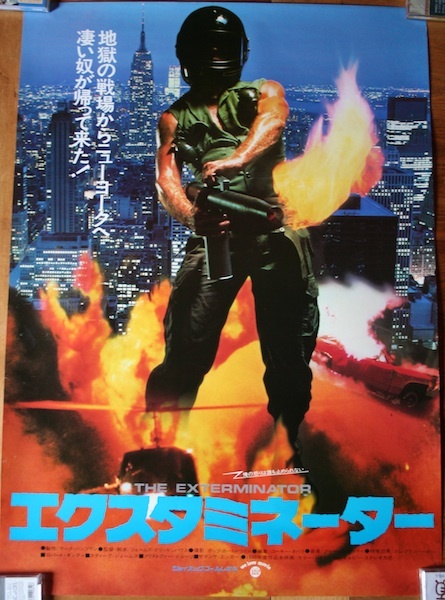 Superb, if somewhat misleading poster design for James Glickenhaus' exploitation classic The Exterminator. This looks great in the photo but trust me, it looks even better on paper. This one will definitely be framed and hung on my wall. Wow! Rad poster! You have the best luck finding these gems. There's something about a faceless man in a motorcycle helmet wielding a flame thrower that would make me cross over to the other side of the street... Very nice catch Mart and am like RobotGeek, very jealous - I wouldn't have the money or the eBay-skillset to net a beauty like this. I love the poster artwork for Exterminator II as well - it makes it look like an Italian post-apocalyptic movie but what a beauty ! rG, Thanks, it was pretty lucky I found these, I missed out on the Escape From New York one I was really trying to get, it just got too rich for me. Wes, No real ebay skills required and the poster cost surprisingly little, it's the postage that costs but if you are buying a few together it brings it down. Still one more to come and it's a little more mainstream than usual but one I'm really pleased with.